Can Be A Great Option! What are dental implant dentures? It sounds a bit confusing! Basically, dental implant dentures are normal full dentures that are supported and held in place by dental implants. A dental implant is like an artificial tooth root. It is usually made of surgical-grade titanium. If you have a denture that is loose, and your dentist cannot get it to fit any better because your jawbone has shrunk down too much, then it may be possible to fit 2 or 3 standard-sized implants to hold the denture firmly in place. If your lower jaw has shrunk down too much to allow normal implants, it may still be possible to fit mini dental implants. You can read more about this at Mini Dental Implants. Back to Dental Implant Dentures! Usually, full upper dentures are not too much of a problem. We can get them to fit and stay in place quite well because the upper jaw is a better shape for keeping a denture in place. But full lower dentures are a completely different ball game! The lower jaw seems to shrink down much more than the upper jaw over time, and there's no palate to help support the denture. In fact, it's the opposite, because in a full lower denture you have your tongue right there, moving around and dislodging the denture every few seconds! Quite a few dental experts believe that a lot of the shrinkage of the lower jawbone is the result of having a full denture pressing on the entire gum surface all the time. They recommend getting at least 2 full size dental implants placed into the lower jaw, to support the denture before you start to get any problems with the fit. The 2 implants are usually fitted roughly where the eye teeth (or "canine" teeth) would be, and they each have a kind of "pop-stud" fitting on the little bit that sticks through the gum. This clicks into a little fitting on the inside of the denture, and holds it down in place. When you bite down, the biting forces are taken by the implants. When you open your mouth, the denture is held down in place by the pop-stud fittings. You can take the dental implant denture out by getting a good grip on it and clicking it off the attachments. Above, here are 2 pictures of a dental implant denture. This one is held in by screws, so you can't take it out at home. Only a dentist can take it out. The picture on the left shows the dental laboratory plaster model with replicas of the 4 implants in the lower jaw. The picture on the right shows the holes on the inner side of the denture. Tiny screws will be fitted down these holes, into the implants. This will hold the denture as solid as a rock! So how does having 2 implants prevent the jaw bone shrinking? Because the implants will be bearing the weight of your bite, bite forces are transmitted down through the implants into the jawbone, JUST LIKE NATURAL TEETH! This means that the lower gum and jaw bone surface will not have the lower denture pressing on them constantly, and so the jaw bone shrinks much more slowly than otherwise. Additionally, the implants act like tooth roots, transmitting the biting forces from the denture to the surrounding jaw bone in the same way as natural teeth. This "exercises" the jaw bone and helps to keep it at near-normal density, again reducing the shrinkage over time. So the supporting implants take the weight off the relatively large area of the denture base, and transmit it through the bone, the way nature intended! BUT, if we are talking about getting implants to support a denture, why not go ahead and get 4 to 6 implants fitted, and get a fixed bridge to replace the denture? After all, a fixed bridge is more like natural teeth! Well, there are two main reasons; cost, and how much jaw bone you have left. To have a fully fixed bridge supported by implants, you normally need at least 6 implants in the upper jaw, and at least 4 in the lower jaw. These are the minimum numbers - more is better! HOWEVER, for implant-supported dentures, you only need 3 or 4 implants in the upper jaw, and as few as 2 in the lower jaw. Fewer implants means LESS COST. Again, these are minimum numbers - the more implants you have, the more the load from your bite is spread out, and the better the chances of complete success. But you can't get away from the fact that an implant-supported denture needs fewer implants than a fixed bridge. 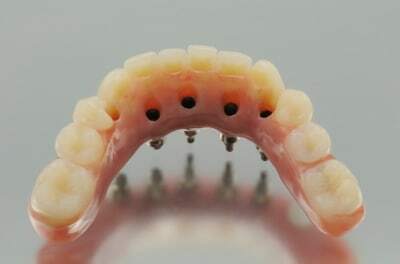 In addition, fixed porcelain bridges are much more expensive to make than dental implant dentures. So, in terms of cost, dental implant dentures need fewer implants than a full fixed bridge, AND the denture itself is much less expensive to make than a bridge. The other major reason to consider dental implant dentures concerns how much your jaw has shrunk down. Your jaw will have shrunk down over the years, since having your teeth pulled. There may not enough jawbone left to hold a lot of normal-sized implants. (Sometimes it is possible to deal with this by bone grafting, but this adds to the cost and the complexity. Have a look at the Bone graft for dental implant page. 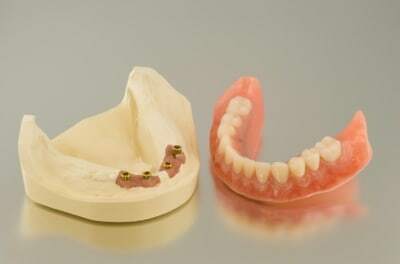 They can be very cost effective - you get dentures that sit firmly in place for much less cost than fixed bridgework. They are very easy to repair if something breaks. Fixed bridgework is MUCH more complicated and expensive to repair. It involves having to remove the bridge completely, and sending it to the lab. AND, repairs to porcelain are notoriously difficult! They are relatively simple for a dentist to do. The exact position of the implants is not quite as critical as it is for implant-supported fixed bridgework. This means the dentist needs less time, which means less cost! It can be much easier to keep the implants clean; you can take out the dentures, and SEE the tops of the implants. This means you can brush them well, and avoid the gum inflammation that I often see around implant-supported fixed bridgework. This Peri-implantitis can lead to implant failure. The best way to get accumulated plaque off the tops of the implants and attachments is with a good-quality toothbrush. I strongly recommend the Cybersonic 3. It has a gentle action so it won't irritate the gums, but it is very efficient at getting plaque off. Read a review of this toothbrush Here, AND get your HALF PRICE discount code! Dental implant dentures can be made smaller than normal full dentures. Because the implants hold them in place, they don't need to cover as much gum! This makes them neater and less of a mouthful. It is also possible to use Dental mini implants. These are small, short implants that can fit into very small spaces where the jaw bone has shrunk down a lot. They cannot carry the same weight that a normal implant can, but for dental implant dentures they can be a useful alternative. So, if you have had full dentures for a few years, and are reasonably happy with them except that they are loose; think about replacing them with dental implant dentures. The total cost will be much less than for fixed bridgework, and they will be almost as secure!